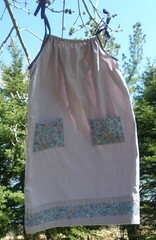 This is the pillowcase dress that I made for Little Dresses for Africa. I used a pillowcase, bias tape, and a floral fabric to create the dress. It is about a size 7 with adjustable ties at the shoulder. The instructions that I used for making the pillowcase dress are HERE. Little Dresses for Africa also has a tutorial with pictures HERE. This was made to donate to Little Dresses for Africa which in turn distributes them to girls who are orphans in Africa. Many of them have lost their parents to AIDS and are on their own. They have one outfit…maybe two. The pillowcase dress is an outfit that they receive to show them that someone cares about them. I was inspired to make this dress because I had read about the project through a link on Twitter. There was a homeschool family who was making the dresses as one of their community service projects. After reading about Little Dresses for Africa as well as the need, I knew it was something that I wanted to do. (3) to teach a class at the homeschool co-op for upper-elementary, junior, and senior high students so they have an opportunity to make the dresses as well. On Friday, April 9th, I made the dress. It ended up taking a bit longer than I anticipated, but I wanted to make the dress one that a little girl would enjoy wearing. The size of the dress is a 7. My 7 year old daughter wears a size 5, but could fit into it. I had her help me by trying on the dress and determining where to place the pockets. So, as I was sewing on the bias tape, pockets, and trim at the bottom of the dress, I thought about a girl in Africa who would be receiving the dress. She would be about my daughter’s size…perhaps even around her age. I tried to imagine the difficulties already present in her young life…and how we often take for granted the simple things in our lives. I took my time with making the dress because I want this little girl to know that someone does care and wants her to be comfortable and have something she can wear. I added 2 pockets to the dress so the girl who receives it can put her hands in her pockets, collect natural things she finds on a walk, or carry a little toy or items around her home or village. On the bottom of the dress, I added about a 2” trim of fabric that coordinates with the pockets. I stitched and doubled stitched areas that I thought may receive more wear and tear. I want the dress to last for some time and not come apart since I’m not sure what sewing supplies the girl would have to mend her dress. After I was done making the dress, I had my daughter try it on. She had a HUGE smile on her face, despite the fact that it was not her dress. I’m hoping that this is the same type of smile that the little girl who receives the dress I made will have on her face! My youngest daughter said that she can’t wait to make a dress so it can go to another little girl. So, that’s the last part of my goal with this project: to help my daughters make dresses for Little Dresses for Africa. [In doing this project we are] “honoring a special group of moms… who can no longer hold their daughters or provide them clothes. Most died from AIDS or other illnesses and their children were left as orphans. I’m hoping that the dress I made as well as the ones I’ve guided other children and teens to make do make a difference. this is such a great idea!! very inspiring. i have really enjoyed reading all of your recent posts. i love the recipes you've been making…i want to make those breadsticks! :0)i am having a button giveaway, if you want to pop over and leave a comment! It's beautiful. I'm thinking of the pillowcases I have right now so I can make one for my daughter.